[Jesus said,] "And the Father who sent me has testified about me himself. You have never heard his voice or seen him face to face, and you do not have his message in your hearts, because you do not believe me — the one he sent to you." God sent Jesus to touch our hearts and call us back to himself. He sent him with a message of grace and with deeds of kindness. He sent him to proclaim the coming of the Kingdom and to call us to live by Kingdom values. Incredibly, so many reject him, either through blatant disregard or through explicit rejection. Jesus, however, makes a powerful statement. Effectively he says, "If you are choosing the Father, then you must choose me. If you reject me, you reject the Father, the One who sent me." Crucial? Absolutely! Challenging? Yes indeed. Exclusive? 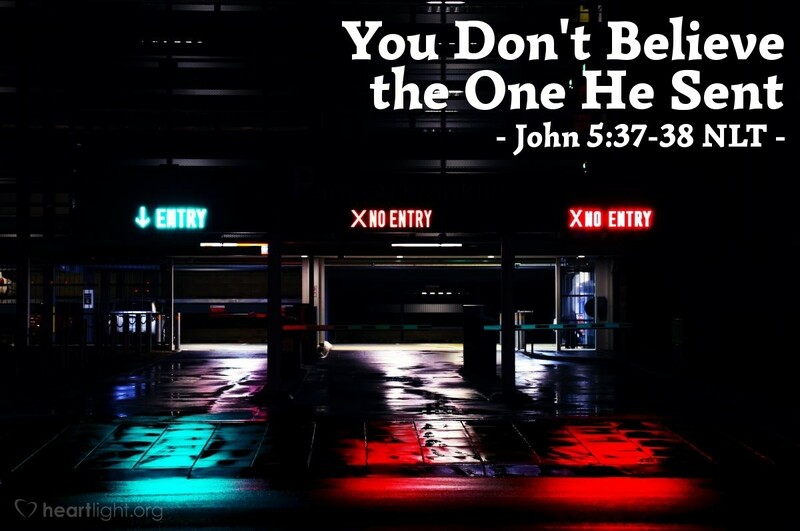 Yes, Jesus calls us to decide about him because he claims to be THE way to the Father. The issue isn't what we think about those claims, but whether or not Jesus is who he claims to be. If he is, then everything for us hinges on our decision about him. The issue isn't whether it is politically correct for Jesus to claim to be the one way to the Father, but whether or not he is eternally correct. Father, thank you for sending your Son to reveal you and save me. I truly believe that Jesus is your Son and died to save me from my sins. Help me to share my faith in Jesus with those that I love and to do it with gentleness and respect so that they, too, can come to see Jesus for who he is. I pray this in his precious and holy name. Amen.